Bedford Window Cleaning specialise in Roof Deep Cleaning to remove all moss and debris that has built up on your roof. We have a tried and tested method of cleaning your roof and removing all the moss, we have the ability and experience to clean all domestic roofs safely using a combination of MEWP (Mobile Elevated Work Platforms) and scaffold towers. We ensure all works are being carried out to strict safety standards. We can clean most roofs, using our specialist equipment, however there are a small number of roofs that we cannot access, and if the roof is in a bad state of repair we may be unable to provide our services. Before we begin any cleaning we conduct a detailed areial survey to visually inspect the roof of your property, we will need to inspect both the outside and interior roof void for any damage to the roof lining, tiles or existing water ingress. Once our inspection is complete and we deem the roof to be in the right condition we can provide a quote for our services. Why get your Roof Cleaned? If the moss and algae is left un-kept it becomes a constant source of debris that will clog up your gutters which can cause leaks and damp around your home. The only way to ensure that you remove all of it and prevent its reoccurrence is by first killing all of the moss using a chemical treatment, and then by removing all the moss and applying a layer of prevention. We offer two different types of roof cleaning service. Our Roof Soft-washing moss removal service comprises of serval visits over 12-18 Months to kill and removal all moss from your roof. This is the lower cost option when it comes to cleaning roofs the only downside being that the process takes longer. We would use a 4 stage process to clean your roof. Spray roof with a moss and algae removal chemical, this will soak directly into the moss, algae and lichen and being to kill the growths. We also clear the gutters art this point to ensure that they are fully clear.This process takes around 2 hours depending on the size of the roof. Around 3 months later we re-visit the property to assess the progress of the chemical treatment, the moss will have started to fall from the roof, so we would then clear the gutters and assess when the moss is ready for the second treatment. Second treatment with the moss removal chemical and further gutter clearance. By this stage in the process the majority of the moss will be dead and have fallen from the roof, so this is a targeted approach to kill off any remaining growths and cover the roof in a layer to prevent re-growth. The final visit comprises of a final roof inspection to ensure that all moss has been killed and removed any remaining moss in place is scraped/ brushed and cleared away. The gutters are cleared and inspected to ensure they are not blocked and functioning correctly. We would also apply a layer of chemical to the roof to act as a barrier against re-growth. Our Roof Soft-washing service will kill and completely removal all moss and other growths from your roof, leaving it clean and with a protective barrier that will prevent re-growth for years to come. 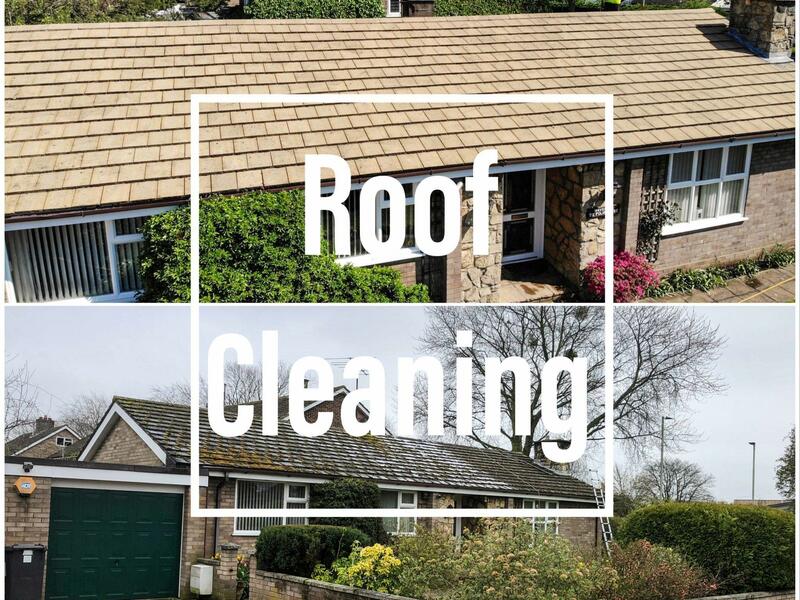 The main difference between how your roof will look compared to the deep cleaning service is the natural colour of the roof tiles will not be restored. Our Roof Deep Clean service is the complete package of several of our services together to ensure your roof is clean, your gutters are clear and will function as intended. We use a 3 stage process to clean your roof. We spray your roof with a moss and algae removal chemical which works by killing all the moss and algae at its roots to enable easier removal. This process usually takes around 2 hours depending on the size of the roof. We return to your property around 2-4 weeks later after the chemical has had a chance to do its work properly. On this visit we start by putting debris stoppers in your gutter down pipes to ensure the moss doesn't clog them up. We also cover the exterior of your property with tarpaulins to catch any moss fall that occurs during cleaning. We then begin to remove all the moss and algae and other dirt from the roof to leave the roof tiles looking like their original colour. Once we have cleaned the roof we clear out all the gutters to ensure there is no moss left in them. We also wash-down any soffits and guttering on the property. Following this we collect all of the fallen moss and take it away for disposal. Finally we finish the cleaning process by cleaning the windows. When we leave your property we aim to leave it as clean as possible. Once the cleaning process has finished the roof is ready to be sprayed with a moss and algae prevention chemical. Facts about the chemical spray we use (According to the manufactures website). Can be effectively used on tarmac, patios, brick, stone and wood to remove and help prevent green mould and algae growth. Can also be used on fencing, boats, sheds, greenhouses, garden statues, UPVC Windows. Contains no acid or no bleach therefore the solution can be applied to all the areas stated above without the fear of discolouration. Helps to prevent the re-growth of green mould and algae as it creates an invisible barrier that is active for up to 6 months. In our experience you can expect several years without re-growth, we recommend that you have your roof re-sprayed every 2-5 years to kill off any spores that have settled and to prevent re-growth. The frequency your property will require this will be different depending on your property location. Highly concentrated formula that is one of the strongest green moss and algae removers available on the market. Once dried, pets and children are safe to re-enter the treated area. What is the active ingredient in your chemical spray? The active ingredient is Benzyl Alkyldimethyl Chloride. Is it harmful to aquatic life? Yes, This product is toxic to aquatic life, and will kill fish. We cover any areas of the property that contain aquatic life, however minimal run-off is not harmful. The chemical is completely safe once dried. In our experience since using this chemical, we have found it to be highly effective at tackling mould, algae, moss and other growths, its powerful stuff. Do you offer roof repairs? No, we purely offer a cleaning service, this is why we fully inspect the roof prior to cleaning to ensure there is not any damage or repair works needed. Don't just take our word for it, look at what our customers have to say. The difference before and after treatment was amazing. Excellent service from a professional team.